Elizabeth E. Stephens serves as managing attorney of Sullivan Hill’s Las Vegas office. She practices in the area of insolvency and bankruptcy, primarily representing trustees and creditors in consumer bankruptcies. She is also an experienced appellate lawyer, having successfully litigated before the Ninth Circuit, the Ninth Circuit Bankruptcy Appellate Panel, courts of the District of Nevada and the Supreme Court of the State of Nevada, as well as the State of Wisconsin. She is admitted to practice before the United States Supreme Court. Originally from Milwaukee, Wisconsin, Ms. Stephens graduated from Marquette University Law School where she was a staff editor of the Marquette Law Review. As an assistant state public defender for the State of Wisconsin in the Appellate Division, she litigated hundreds of criminal appeals in the state and federal courts. Prior to joining the firm, Ms. Stephens also represented consumer debtors in Chapter 7 and Chapter 13 bankruptcies. In re Deichler, Case No: BK-S-09-16135-BAM. In re Ana J Fox, Case No: BK-S-10-19096-LBR. In re Grower’s Direct Coffee, Case No: BK-S-09-16135-BAM. In re Otterstein, Case No. BK-S-09-10630-MKN. In re Quinn, Case No. BK-S-10-27614-LBR. Weinstein Fox, 302 P. 3d 1137 (Nevada 2013). In re Elias, Case No: BK-S-188 F.3d 1160 (9th Cir. 1999). Select Sentry Ins. Co. v. Meyer, 18 Wage & Hour Cas. 2d (BNA)(D. Nev. 2012). In re Galvez, 115 Nev.417, 990 P. 2d 187 (Nev. 1999). In re Hall, 2011 WL 4485774 (9th Cir. BAP). State ex. rel. Oliver v Guolee, 179 Wis. 376, 507 NW 2d. 145 (Wis. App. 1993). Elizabeth E. Stephens, “Using Appearance Counsel in Court: Risky Business?” ABI Journal, Vol. XXXVII, No. 11, November 2018. Elizabeth E. Stephens, “Proof of Claim: To Sign or Not to Sign?” Consumer Bankruptcy Newsletter, Vol. 14, No. 6, October 2016. Elizabeth E. Stephens, “PACT Will Not Prevent Trustees from Attempting to Claw Back College Tuition Payments,” ABI Journal, Vol. XXXV, No. 2 February, 2016. Elizabeth E. Stephens, “Should Bankruptcy Trustees Retain the Ability to Claw Back College Tuition Payments Under Section 548,” ABI Consumer Bankruptcy Newsletter, August 2015. Elizabeth E. Stephens, “Bankruptcy Exemptions in Nevada: A Mash-Up of State and Federal Law,” Comminque’ Vol. 36 No. 3, March 2015. Ms. Stephens is a member of the Nevada Bar and admitted to practice before the Ninth Circuit and the District of Nevada. 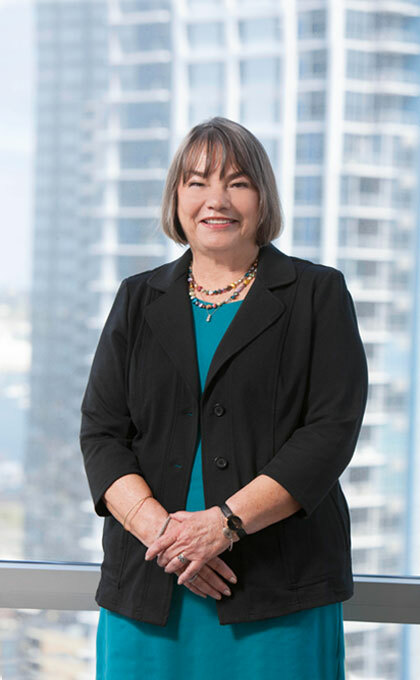 She serves as co-chair for the American Bankruptcy Institute’s Consumer Bankruptcy Committee and is a member of the Southern Nevada Association of Bankruptcy Attorneys, the Southern Nevada Association of Women Attorneys and the National Association of Bankruptcy Trustees.